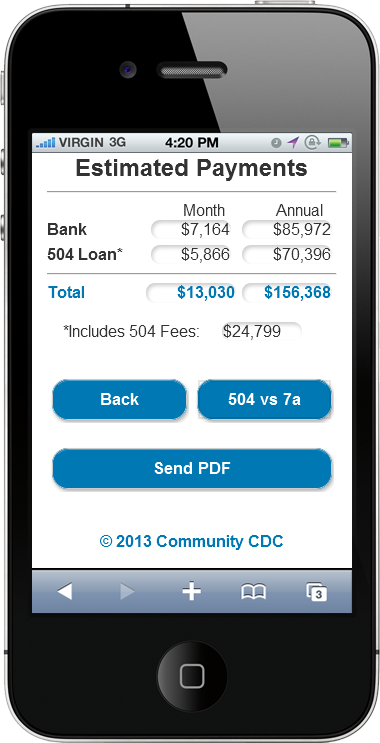 Community CDC of Houston, TX recently launched a new mobile web site for calculating Small Business Administration (SBA) 504 loans. They are now able to circulate the website to bankers, CPAs and other financial firms so they can get a quick estimate on a loan via any smart phone from anywhere at any time. They know that their lending partners are using mobile technology more and more frequently, so having a mobile 504 loan calculator is perfect for them, and will strengthen their working relationships. Here are a few screen shots of the mobile web site. The left image is the home page navigation options, the center image is the results of a calculation, which can easily be emailed to anyone in pdf format. The right image shows how easy it is to contact staff members. Users can access this website by scanning a Quick Response (QR) code, or by typing the domain name into any browser on your smart phone. Try it yourself – just type in CommunityCDC.mobi. These calculators are available to CDCs across the nation. If you’d like to have one for your CDC, give us a call at 317-299-5150 or email sales@provim.net and we’ll explain what is available and all the options. 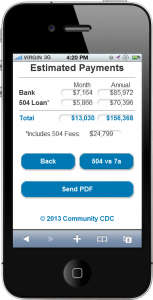 This entry was posted	on Friday, November 15th, 2013 at 3:04 pm	and is filed under 504 Loan Calculators. You can follow any responses to this entry through the RSS 2.0 feed. Both comments and pings are currently closed.